Aiko Goto appears courtesy of the Australian Chamber Orchestra of which she has been a member since 1998. Aiko began studying the violin at the age of three through The Suzuki Method. And she studied at the Toho Gakuen School of Music then went to New York in 1991, to pursue graduate studies at The Juilliard School of Music where she studied as a scholarship student under Dorothy DeLay and Masao Kawasaki, graduating in 1994. As a winner of Artist International’s 1994 Young Artists Award in NY, and The All Performance Music Society Competition of Japan, Aiko made her New York Debut at The Carnegie Weil Recital Hall in 1995 receiving the highest critical acclaim. 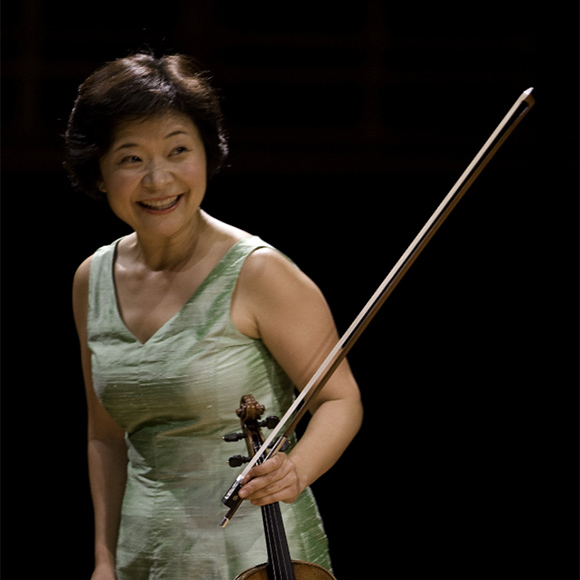 In 1997, she played for The International Refugee Fund attended by the Japanese Royal Family. Until 1998 Aiko was the coordinator of strings in the faculty of the Newark School of the Arts in the USA. Aiko has been a member of The Saito Kinen Orchestra, under their music director, Seiji Ozawa, since 1995. Since 2000 she has held annual solo recitals in Sydney and also has performed in charity concerts, raising money for exchange students, at the Japanese Embassy in Canberra. In 2006 Aiko performed recitals in Tokyo for the Australia-Japan Year of Exchange. Aiko enjoys teaching and sharing her love of music with young musicians and has tutored at the Australian Youth Orchestra’s National Music Camp. She has been a mentor for the ACO’s Emerging Artists Program and *ACO2 since its inception in 2005 and enjoys an active role in the young players’ development. In 2010, Aiko played at Nobuko Imai’s Viola and Chamber Music Festival in Japan and Saito Kinen Orchestra’s tour to US. In 2011, she performed in charity concert ‘Concert for Japan’ in Sydney, Saito Kinen Orchestra’s tour to Beijin and Shanghai, and the ACO’s International tours to Japan, Korea and Europe. In 2012, she joins playing with Sonus Piano Quartet, based in Sydney.